The FlightLine 1120mm FW-190 is a fresh update of Freewing’s popular FW-190 from 2011. Several key improvements bring this wonderful aircraft up to date with the other FlightLine single engine warbirds released in 2016: Flaps, improved servos and retracts, a powerful 4s outrunner motor, and a 4s capable ESC. The new power system gives this aircraft improved top speed, vertical climbing power, and overall flight performance. In addition, the FlightLine 1120mm FW-190 sports a new base paint scheme and three decal options inside the box. 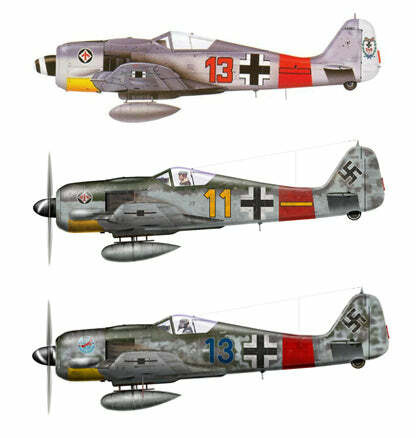 Customize your FW-190 to stand out at your flying field! The model assembles in mere minutes, with 98% screw together construction. Glue is only required for the cosmetic cannon barrels. The FW-190’s removable wing makes transportation very convenient for this daily fun flyer. Durable retractable landing gear and flaps make landing a breeze. Visit the Official FlightLine FW-190 V2 Discussion Thread on HobbySquawk.com for additional photos, videos, reviews, and customer Q&A. September 11, 2018 - The FlightLine RC 1130mm FW-190 V2 recommends a 4S 3000 mAh Lipo, but a 3S 4000 mAh of equivalent weight and similar dimension can be used. Note, this model doesn't have a very large battery bay. Great flying plane. Super scale details. Check the blades of the 3 blade prop very carefully after every flight. I have about 15 flights on mine. Today I was flying and one of the blades decided to part from the plane. I cut power after aprox. 1 second. In that second the motor almost left the plane, tore up the engine cowl, shook off the rudder, tail wheel , right flap panel and the ***** machine guns. I was able to make a quick emergency landing with no other damage. It is amazing the damage that can occur from severe vibration imbalance alone. Rather than repair the cowl and engine mount I just decided to buy a new fuselage . It would be very difficult to match the paint. Love the plane but on the first flight the hobbywing 60 amp esc didn't supply sufficient power to the servos determined the sbec to not be enough. ( After my friend and I discovered the same issue in his flightline p38, unfortunately he was unable to recover and the plane is a total loss.) Anyways before I bypassed the sbec the plane would brown out for about ten seconds and then would basically reset and if you were lucky you could recover, assuming you had the altitude. So I pulled the red wire out of the esc connector to the receiver and installed a separate Rx battery pack to supply the servos and gear power. Works like it should now. Other than that the plane flies beautifully and it's very fast. ( Had to make three passes in order to land the first time.) I would give more stars if the each could handle more servos on a 4s setup. The FlightLine RC Fw-190 is a solid flyer. I have been in the hobby about 3 years and found the Fw-190 a very well behaved aircraft with satisfactory performance using the stock motor and propeller, having flown the aircraft about 15 times. Assemby - Despite the instructions which imply you need to install the servos, the aircraft comes out of the box largely assembled; you need only to attach the horizontal stabilizers, wing, install rudder/elevator/aileron and flap linkages, and then install/program the radio. Probably about an hour's worth of work, not including any of the cosmetic things like applying the decals, and gluing on the guns and the drop tank. My maiden was delayed as I expected the ESC to have a "T connector" (Dean's plug), however my model had an XT-60 connector. As I don't have any batteries with XT60 connectors, I had to order the parts to make an adapter. Radio setup - I used an Admiral RX600SP receiver, DX9 transmitter. I programmed flight modes with flap selection, however this turned out not to be necessary. I set up the aircraft using the manual- provided control throws. After the first flight, I reduced the rate for ailerons from 100% to 70% and elevator from 100% to 85% to prevent over-controlling. I used the following expo settings: aileron: 25%, elevator: 20%, rudder: 20%. I used the same settings for all flight modes (flaps up, takeoff flaps, and landing flaps). I used the following for the flap system: Flaps up: -100%, elevator: -12% Flaps takeoff: -46%, elevator: -34% Flaps landing: -13%, elevator: -36%. With this setup, there is no perceivable pitch trim change with flap deflection. The model is equipped with plain flaps of modest chord; I understand the real aircraf had split flaps. The model flies fine with the flaps up; there isn't a huge change with them deflected. Also, the model's tailwheel doesn't retract. Flying Qualities - After the first flight, I had to adjust the elevator linkage to trim the aircraft with the servo centered. Due to the design of the control linkages, you'll need a pair of pliars to adjust the length of the linkages. The wide landing gear stance make takeoffs are straight forward, using partial throttle and right rudder to track centerline. Landings are rather easy; especially wheel landings. The model is good for mild acrobatics - rolls, loops, etc. I have flown this model only from a concrete runway; it might do okay on short grass. I flown the aircraft with an Admiral 4S 14.8V 50C 2500 mAh battery; I get 7-9 minutes of flight with <30% remaining. This is my first model with a three-bladed propeller and the performance was better than I expected. However, I want to fly this with a two-bladed propeller, but the hardware necessary (FlightLineRC Motor Shaft Type A, SKU: MO1364841) has been out of stock. Summary - This model is of high quality and nice finish, and I expect it to last a long time. I haven't yet installed the guns or decals. My only complaint is the small size of the battery compartment. The Admiral 4S 14.8V 50C 2500 mAh battery takes up the whole space; with the battery installed the center of gravity is a little forward of where I'd ideally like it. However, this is a WWII fighter, not a 3D acrobat. It doesn't really spin well, but otherwise the flying qualities are fine with the forward center of gravity. I think you would have a hard time installing a battery larger than the Admiral 4S 14.8V 50C 2500 mAh battery (137 mm x 43 mm x 23 mm) without having to make a major modification in order to get the battery to fit. Originally I had wanted to fly this with 5S power (the ESC will handle up to 6S), but whatever additional performance you might get out of the 5S battery is going to reduced by both the additional weight of a 5S battery and whatever aft ballast you're going to have to add to get a reasonable center of gravity. This model would make a great second or third aircraft after graduating from a trainer. Sehr schönes der Focke Wulf -190 A8 von FlightLine. Drei verschiedene Dekorbögen machen das Modell zu einem wirklichen Hingucker. Tolle Flugeigenschaften, einfacher Zusammenbau und schöne Optik zeichnen das Modell aus. This was my first low wing plane. It flies great, and after 2 years (and lots of hard landings) it still flies and looks great. For the money, one of the best scale airplanes out there. Upon receipt, one retract worked intermittently. MRC was very quick with a replacement. During maiden flight, the plane took off great and trimmed out quickly. Then the sticks went dead for about 10 seconds. Once signal was recovered, I was able to make a rough landing in some tall grass. Minor cosmetic damage wasn't too bad. Second flight had the same problem, resulting in another grass landing that popped the landing gear housings out of the wings. Gear still works after some hot glue. The signal loss is strange to me. I use the same Spektrum TX/RX on a P-51 with no issues at all. I sent MRC a notification of my faulty ESC suspicions almost 2 weeks ago and have not heard a reply. Maybe the holidays have them backed up. Up until now, I have had nothing but great things to say about MRC. I got this for my husband as a birthday gift and he is really enjoying it! It flies great and he is very happy with the quality and the way it handles. Definitely recommend!